To holdfast or not to holdfast? I recently completed my workbench, its an English plank style bench, but I put a split with removable tool holder between the 1st and 2nd plank to clamp. I drilled dogholes in the front apron, and originally had planned on drilling more in the top and getting 2 holdfasts. But now that I have been using it a couple weeks I am wondering if I actually need holdfasts. Anybody have experience with using vs not using them and give pros and cons, if they are needed for certain operations and if 1 is enough, etc? If someone gave me the choice of either having vises on my bench or holdfasts, but not both, I would keep the holdfasts and not have a vise. Obviously how someone works, what materials and other factors will be different from person to person but holdfasts are so fast and versatile for any work being done that I use them all the time. The more I use them, the more ways I find to use them, as well. If you are going to get holdfasts, buy a pair. (I have the Gramercy ones from Tools for Working Wood and they are great bang for the buck). A single hold down point can allow a workpiece to pivot, while using two will lock it down tightly. There are many woodworkers out there that do all their work holding with vises and clamps that have never touched a holdfast. It’s certainly possible to work that way—I’ve been there. Once I started to use holdfasts, however, it opened up a whole new world of possibilities in work holding. There are many woodworkers out there that do all their work holding with vises and clamps that have never touched a holdfast. It s certainly possible to work that way—I ve been there. Once I started to use holdfasts, however, it opened up a whole new world of possibilities in work holding. 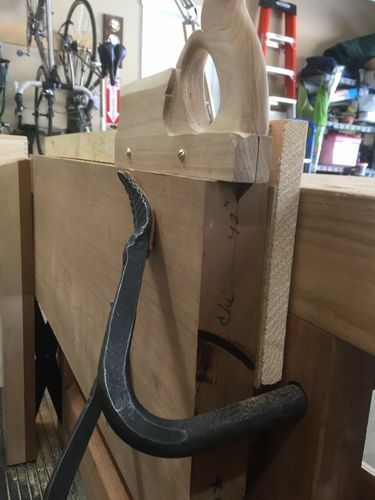 and then use something to hold down a batten ( I think that’s what its called, basically stick with notch cut out), I usually see people do this with holdfasts. Just wasn’t sure if there was a better way. Thanks! I have vices and dog holes in my bench. Use the holdfasts and vices depending on the work required. Batten and bird’s mouth as needed as well. My holdfasts were blacksmith-made, and were MUCH less expensive than Gramercy models. I have vises as well as holdfasts, and use them both a lot. I own the gramercy holdfasts, and they have never let me down. They are a bit expensive, but totally worth it in my opinion. Are they still available somewhere? All the blacksmiths I have found charge 4-8 times more than the gramercy ones. I don’t even think I could buy the steel rod much cheaper than $19. Would appreciate a link as I was hoping to order this week if I do get some. Thanks! And end vise with a dog will work best. That’s what your dog holes are really intended for. You can also check the cam action holders Lee Valley sells them. I think they are called bench blades. and then use something to hold down a batten ( I think that s what its called, basically stick with notch cut out), I usually see people do this with holdfasts. Just wasn t sure if there was a better way. Thanks! 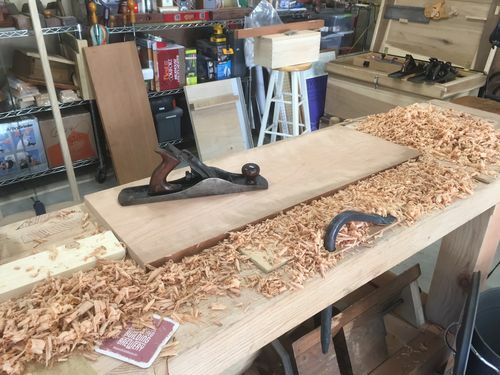 I use a planing stop and batten held by a holdfast a lot for surface planing, and it’s very fast to switch faces or from board to board. It’s a great system for access to the full face of a board. When only needing to work part of a surface, making a groove, for instance, then I like to use two holdfasts instead. Using a pair is also handy for working pieces that are not rectangular. I use my holdfasts more than my leg vise or end vise. Combined with birds mouths and battens the work holding possibilities are endless. Mine are from Blackbear Forge They are based on Phil Koontz’s design. These are not cheap and I have 1” dog holes, BlackBear also has plain holdfasts. I can lift one end of the bench with a board clamped with these. 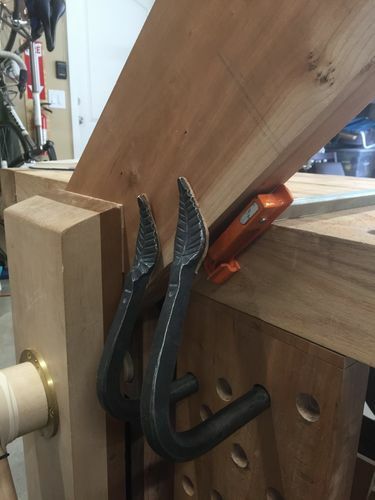 I use my holdfasts more than my leg vise or end vise. Combined with birds mouths and battens the work holding possibilities are endless. Mine are from Blackbear Forge They are based on Phil Koontz s design. Ah yes, he was there at a local Lie Nielsen event earlier this month that I went to. I really liked the traditional ones, but $100. And even the “basic” ones were more than double the Gramercy. Plus I was buying some Lie Nielsen tools so left there broke, lol. I did almost buy one of his planning stops, he had some really cool looking ones. Definitely quality looking products though! It was definitely a splurge to get the Leaf style, his regular 3/4” style are $45 per. Long wait times though, he was out ill for part of last year and is still catching up. I started using holdfasts about 5 years ago and can’t imagine not having that option now. It is just another way to hold work, the more ways the better. I use mine all of the time. I was aware of the waitlist, which was why I was tempted to buy one at the LN event, since he had a few of each on hand for sale at his booth, and no shipping. But I wasn’t sure if 1 was enough, and would like a matching pair if I got 2. If I was rich, I could have easily spent $1k at his booth with the other stuff he had like axes, hatchets, chisels, etc. I can’t imagine doing hand tool work and not having holdfasts. I have the Gramercy pair; they work well and were reasonably affordable. I agree with most of the above. Holdfasts have been a valuable addition to my bench. I use them way more than I ever thought I would. They present a whole slew of workholding opportunities in addition my end and leg vises. I have a pair of the Gramercys as well and find them entirely capable of anything I’ve ever asked of them at an excellent price. Like the pictures Kevin posted above, I glued some leather to the faces of mine to minimize and marks left of wood. Works wonderfully. Thanks all. I just ordered that Lee Valley planning stop and a pair of Gramercy holdfasts. Those 3 items and some pegas coping saw blades all came out to about $50 plus shipping, not bad!